A total of 131 patients with solid pancreatic masses were prospectively enrolled and randomly assigned to undergo endoscopic ultrasonography (EUS)-guided fine-needle aspiration (FNA) with either a 22-gauge or 25-gauge needle . Both study arms were comparable with respect to patient demographics, tumor size and location, and the use of anticoagulants and drugs affecting platelet function. The EUS–FNA was performed in a standard manner with on-site assessment of sample adequacy by a cytology technician. The final cytologic diagnosis was made by a cytologist blinded to the needle size used. For the purpose of the analysis, cytologic findings negative for malignancy, atypical and suspicious were considered nondiagnostic. The gold standard was not specified in the paper. The number of patients without malignancy who were punctured but not included in the analysis (only malignant cases were analyzed) remains unclear. The study results are summarized in [Table 1]. 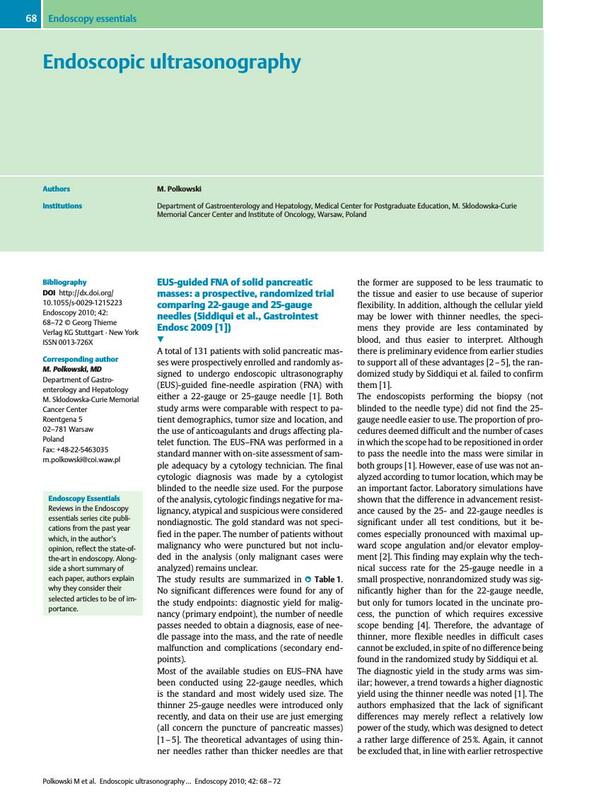 No significant differences were found for any of the study endpoints: diagnostic yield for malignancy (primary endpoint), the number of needle passes needed to obtain a diagnosis, ease of needle passage into the mass, and the rate of needle malfunction and complications (secondary endpoints). Table 1 A randomized comparison of 22-gauge and 25-gauge needles used in the endoscopic ultrasound-guided fine-needle aspiration of pancreatic masses 1. Study endpoint 25-gauge needle(n = 67) 22-gauge needle(n = 64) Diagnostic yield, no. of patients (%) 64 (96) 56 (88)* Mean (± SD) no. of passes needed to obtain a definite diagnosis 2.6 ± 1.2 2.6 ± 1.2 Easy needle passage, no. of patients (%) 57 (85) 51 (80) Need to change scope position, no. of patients (%) 10 (15) 15 (23) Needle malfunction rate, no. of patients (%) 10 (15) 11 (17) Complication rate, no. of patients (%) 0 (0) 0 (0) *P > 0.05 for all comparisons. Most of the available studies on EUS–FNA have been conducted using 22-gauge needles, which is the standard and most widely used size. The thinner 25-gauge needles were introduced only recently, and data on their use are just emerging (all concern the puncture of pancreatic masses)     . The theoretical advantages of using thinner needles rather than thicker needles are that the former are supposed to be less traumatic to the tissue and easier to use because of superior flexibility. In addition, although the cellular yield may be lower with thinner needles, the specimens they provide are less contaminated by blood, and thus easier to interpret. Although there is preliminary evidence from earlier studies to support all of these advantages    , the randomized study by Siddiqui et al. failed to confirm them . The endoscopists performing the biopsy (not blinded to the needle type) did not find the 25-gauge needle easier to use. The proportion of procedures deemed difficult and the number of cases in which the scope had to be repositioned in order to pass the needle into the mass were similar in both groups . However, ease of use was not analyzed according to tumor location, which may be an important factor. Laboratory simulations have shown that the difference in advancement resistance caused by the 25- and 22-gauge needles is significant under all test conditions, but it becomes especially pronounced with maximal upward scope angulation and/or elevator employment . This finding may explain why the technical success rate for the 25-gauge needle in a small prospective, nonrandomized study was significantly higher than for the 22-gauge needle, but only for tumors located in the uncinate process, the punction of which requires excessive scope bending . Therefore, the advantage of thinner, more flexible needles in difficult cases cannot be excluded, in spite of no difference being found in the randomized study by Siddiqui et al. The diagnostic yield in the study arms was similar; however, a trend towards a higher diagnostic yield using the thinner needle was noted . The authors emphasized that the lack of significant differences may merely reflect a relatively low power of the study, which was designed to detect a rather large difference of 25 %. Again, it cannot be excluded that, in line with earlier retrospective studies, not only are both systems equal in terms of diagnostic yield, but the thinner needle may actually be superior  . Because complications associated with EUS–FNA are very rare (none were observed in the discussed study), a study to adequately compare the risk associated with different needle sizes would require several hundred patients included in each arm, and is, therefore, unlikely to ever be conducted.